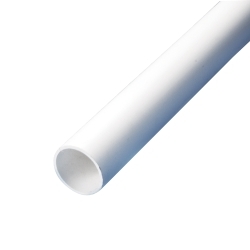 1-1/4" White PVC SCH40 Plain End Pipe | U.S. Plastic Corp. The E-Z Anchor is a very simple yet effective anchor system for the boating industry. Many other similar augers are constructed of heavy steel or aluminum. The E-Z Anchor is injection molded from PVC, making it tough and lightweight. 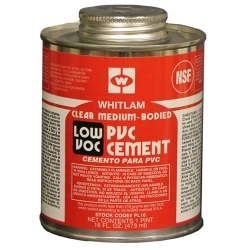 The durable PVC material used will not corrode or leave stains unlike many other similar products. Although the primary use of the anchor is for mooring boats and PWC's while on the beach or sandbar, the E-Z Anchor can also be used for holding fishing poles as well as umbrellas. 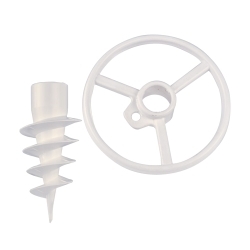 The E-Z Anchor is sold as a 2 piece kit consisting of an auger tip and a round handle. Molded PVC components ensure assembly is effortless. All that is required is a piece of 1-1/4" diameter PVC pipe cut to desired length and a little PVC cement (sold separately). Simply glue each piece on opposite ends and the E-Z Anchor is ready to use. You can cut to any length you require. Recommended lengths: Boating 3' - 7', Fishing Pole Holder 18" - 36", and Umbrellas 12" - 24". Made in the USA.